Yeah! Episode 3 is now live on Amazon. Episode 1 is of course here. Episode 2? Well, look – here it is. Episode 4? In progress. As we speak. I kinda liked having the little preview of Episode 3 on the website, so I imagine I’ll be posting up one of those before Episode 4 goes live. So, swing back around as often as you like. I’ll be here. Episode 3 is with the editor. Barring any really big mistakes or rewrites, it should be coming very soon. In anticipation of that, I’m going to try something new. Here is an excerpt from Episode 3. Not going to go into lots of detail. Those of who who have read Episode 1 and/or two know who the characters are. Truthfully, you don’t need to know that to get this passage. And if you haven’t read Episode 1 or 2, maybe this will tempt you to try them out. A nurse came in to adjust Vargas’ medicine. It was too early for him to wake up. She raised the dosage. “He’ll be asleep again in five minutes or less,” she said as she left quietly. Vargas started to laugh then tried to restrain himself. It didn’t work very well. “Aww, what are you crying about? Ribs aren’t even broken. Some day I’ll tell you about the time I got blown up in Iraq,” Bannister said. Vargas was smiling, but his eyes were turning glassy. Bannister knew he was starting to float into sleep. He stood there. Watching over his new charge. Watched his breath rise and fall evenly. Painlessly. Knowing that it was his fault. Knowing that if he had killed Ziccardi the first time they had tangled then this wouldn’t have happened. Bruno didn’t answer right away. He was fading in and out now. JC’s words filtered through his foggy brain. Started laughing. His bruised ribs didn’t hurt anymore because of the pain medication. “Why?” Vargas said. “You gonna kill him?” Laughed again, then faded completely into sleep. Bannister waited. Until he knew the young man was asleep. Okay. A few days late, but it’s done. Episode 2 is live at Amazon. Well, it is in the US. Other territories to follow. You can click here: http://www.amazon.com/dp/B00IIWVVV4 or just click the awesome picture below. Either one will take you to Amazon. What’s the story? Well, like I may have mentioned before, we get to see JC’s reaction to the bomb Senator Marcus dropped in his lap. Get a little, okay a lot, of backstory on Duke. Hear about how he and JC first met. Some backstory on The General. Oh, and you get to actually meet The General. Little hints of stuff between JC and Joan. Oh, and somebody dies. Not some random bad guy, although that does happen, too. But somebody who has been with the story from, well, Episode 1. You know what, you might just want to read the book. It’ll be better that way. Now, for a little non-story related info. Episode 2 is twice the length of Episode 1. Well, about 85% longer or so. In real terms, Episode 1 clocked in at a paltry 11,500 words or so. Episode 2? A meaty, hefty 20,000. Why the difference? Honestly, it just took longer to get from the start to the finish in Episode 2 than it did in Episode 1. Future installments should be clocking in around 15K – 20K or so. Likely around the 15K mark. As always, reviews are deeply appreciated, either at Amazon or Goodreads. If you do happen to leave me a review, I’d like to thank you personally, so go ahead and drop me a short email at rex@rex-carpenter.com. Of course, if you dig The Fixer, spread the word to family, friends, facebookers, twitterers,, redditterers, myspacerererers, etc. What’s next? Well, Episode 3 is already in progress. I’d like to say it’ll be out next week, but I tried that with my Valentine’s Day prediction for Episode 2 and that didn’t turn out so well. So for the time being, let’s just say… soonish. ps – if you haven’t picked up Episode 1, or haven’t signed up for the mailing list (shame!) the link or picture below will take you to Amazon to take care of the first faux pas and the signup on the right side of the webpage will allow you to rectify the second. The good folks over at Aweber helped me get my newsletter sorted out! So feel free to signup over on the right hand side of the screen. 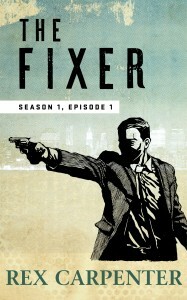 As mentioned, signing up gets you a free story, “The Fixer, Season 1 Prologue: Indonesia.” Plus all sorts of awesomeness, such as news about Bannister and upcoming release dates. If there are any hiccups or problems, let me know, either in the comments here or in email: Rex@Rex-Carpenter.com. I’m a writer. Webpages and html code and formatting and all those technical things are a bit difficult for me. Not beyond me, just don’t come naturally. I’m currently having a wee bit of trouble with getting the newsletter set up. If you want to sign up for it, either email me at rex@rex-carpenter.com or leave a post below with your email address. Directly emailing me would likely be the more secure way. Either way, once I get my newsletter set up, I’ll let you know. I am, however, a writer. And this site is, best I figure, the easiest and most satisfying way for you, my reader or prospective reader, to interact. You get to dig around, find out more about me. Gives you a chance to sign up for my newsletter and get a free story in the process. Plus it kinda keeps things centrally located. I am not the best about updating things. Facebook and I have an uneasy relationship. She wants me to commit but I know she’s not the one. But I just can’t quit her. I think I have a twitter account somewhere. But that twitter, she’s a fickle mistress. And while some may think it is an interesting exercise to limit yourself to 140 characters, I am far too verbose a man to find it so. So while I may have facebook and/or twitter accounts, this will be the place I spend most my time. Outside my books, of course. Thank you. Thank you for checking out my little stories. Thanks for spending a bit of time with JC Bannister and his friends (and enemies). While not a big talker, he does appreciate it. Thanks for swinging by this site. There will be more to come.